Hans Holbein the Younger, 1497-1543, one of Germany's famous artists in art history, painted one of his famous paintings "Erasmus Rotterdam", in 1523. It is a patterned, colorful, profile portrait with an emphasis on rendering detail and the personality of the sitter, a Northern Renaissance characteristic. The intensity of the art is brought out by the darkness of both the clothing and curtains, contrasted with the bright highlights of Erasmus' face, hands, and the letter. The thin line of his mouth and the placement of the sitter's two hands on the letter while writing bring out the calm concentration of Erasmus Rotterdam. The Protestant Reformation brought on problems for many artists living in Germany Holland and England. Statuary, pictures, frescoes, and decoration were thought to be anti-religious and idolatrous. Commissions began to shrink leaving portrait painting almost the sole source of income. In 1528 Holbein the Younger painted "The Virgin with the Family of Burgomaster Meyer". Rich in detail, the artwork is reminiscent of High Renaissance figure grouping compositions. 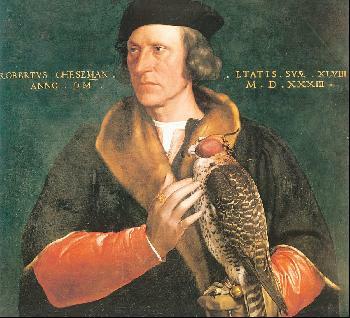 Leaving Switzerland largely fleeing the Reformation, Holbein became the official Court Painter of Henry VIII. His primary occupation was to paint the portraits of the Royal Family. While in England he painted "The French Ambassadors", Jean de Dinteville and Georges de Selve, 1533. Holbein recorded great detail ranging from the fabric design of the curtain, to the fur wrap on the left figure to the rug designs on the floor. Complementing both portraits are a menagerie of equally detailed objects representing each mans' hobbies and interests. Continuing a Netherlandish tradition closely imitating nature Hans Holbein the Younger painted one of his most famous paintings in art history, "Henry the VIII" in 1540. The bold frontal view, with the intense straight forwardness of the eyes, and a straight line of the mouth gives Henry the VIII the aurora of stern authority. Both shoulders almost touching both vertical edges of the painting gave an added formidable wall of character to the personality of Henry the VIII. Other famous artists of the Renaissance art period are Giovanni Bellini and Pieter Bruegel the Elder.